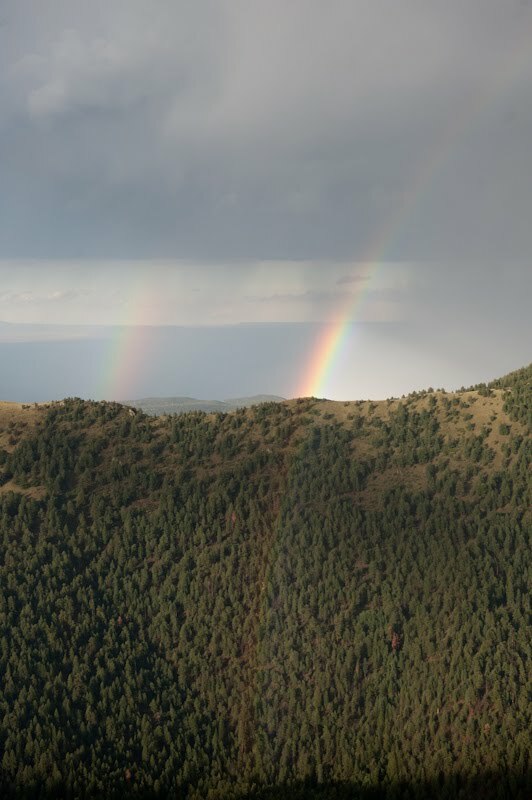 There have already been observed discontinuous rainbows above a ridge for several times. (For example by H. Edens and C. Hinz). 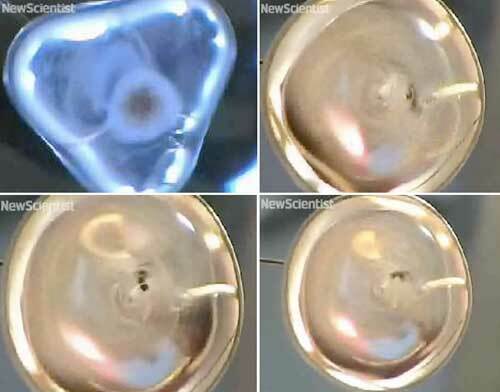 Explanations range from an optical illusion via burst raindrops up to the assumption that there are only large flattened raindrops in front of the ridge which reduce the radius. This is why during my latest observation on June 16, 2011, on Mt. Wendelstein (1838 m), I made the effort to also watching the raindrops. During my observation, there were wind gusts of up to 34 m/sec (122 km/h). In addition, on (my) mountain slope, there were heavy turbulences making the large raindrops come from all directions, even upwards the steep northern slope. These were most deformed of all, some had the shape of vertical ellipses, and some were even almost triangular. Unfortunately, due to the storm I was unable to take valid photographs of the raindrops. From Physical Review Letters (DOI: 10.1103/PhysRevLett. 101.234501) I learned that raindrops of a diameter of about 1 cm and making 3 rotations per second take a triangular shape. 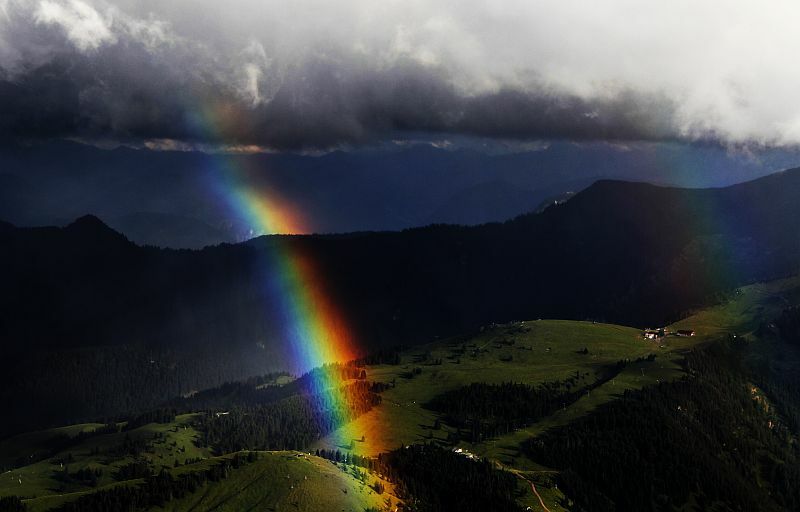 Such kind of rotations must have occurred on my mountain as well as on the neighbouring one where the rainbow appeared. I am sure that such deformations alter the diameter of the rainbow causing those breaks. Does someone have the occasion to simulate rainbows on such raindrops? This is an older observation (from last year). I made it at the Langmuir Laboratory for Atmospheric Research on a mountaintop in central New Mexico, USA at about 10,500 feet altitude above MSL. The photos look to the east-northeast. 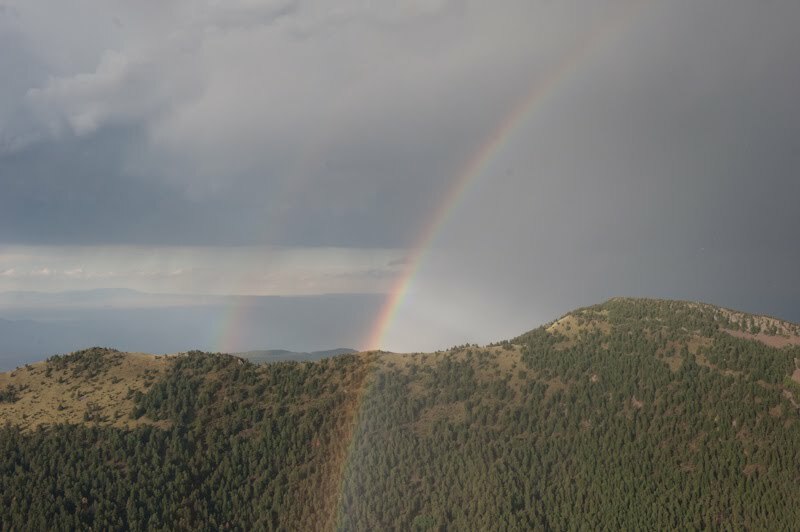 The rainbow occurs in a storm that is receding and drifting to the east and has just passed Sawmill Canyon in the foreground. The mountain ridge on the photo is called Timber Ridge, and most of the heavier rainfall is on the other side of that. 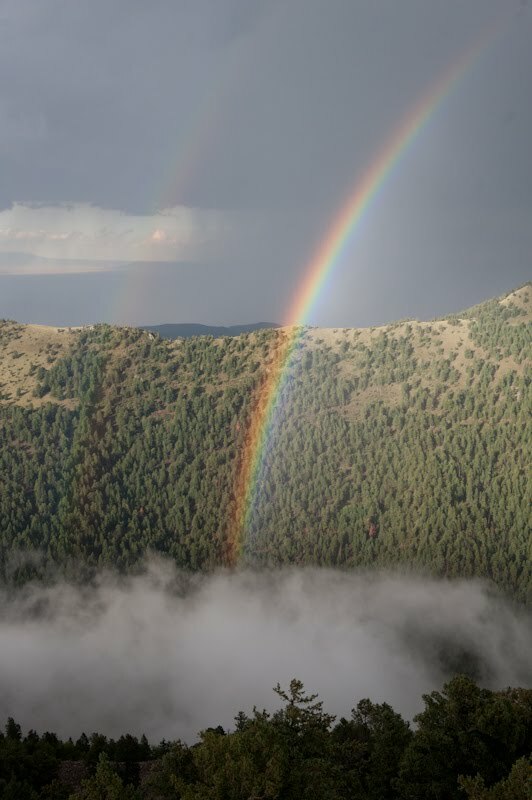 The much finer, mist-like droplets near the trailing end of the storm are still falling in the canyon and create a rainbow that has a smaller radius and is a little wider than an ‘ordinary’ bow that occurs in larger raindrops. The effect is very obvious but requires a fairly specific landscape setting to be seen. The photos were taken on July 27, 2009 using a Nikon D700 camera. Times below are local time (MDT). Photo 1: The effect is just beginning to occur. 18:37:50 pm, 36 mm focal length, ISO 800, 1/160 sec at f/6.3. Photo 2: Effect strongest. 18:43:17 pm, 38 mm focal length, 800 ISO, 1/250 sec at f/8. Photo 3: The rainbow in canyon is disappearing and still shows a discontinuity. Also note that the ‘foot’ of the rainbow beyond the canyon is not following the circle but appears to kink – i.e. the radius is getting larger at lower altitude – maybe due to drops coalescing and increasing in size as they fall? 18:45:11 pm, 48 mm focal length, 200 ISO, 1/125 sec at f/5.6. All three photos have not been cropped, modified or enhanced in any way.